Finding the perfect gown and dresses for your bridal party is hard enough. Taking care of it shouldn’t be harder. Many brides select the gown for the big day, only to realize they have no plan to make sure the dress isn’t a wrinkled mess for their wedding. To make sure you look your best and so do your bridesmaids, Diamond Bridal Gallery is here to help. 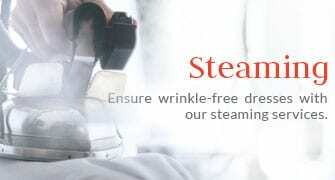 Offering services to both brides who purchased their gown from our boutique, and even brides who purchased elsewhere, we can steam any dress to make sure it’s ready for the wedding day. Customers should bring their gown or dress a minimum of four days before the event to make sure it’s ready. For brides and bridesmaids crunched for time, we also deliver for an additional fee. For more information and rates, call 916.521.9856.